Went to the Los Angeles Comic Book and Science Fiction Convention on Sunday. I’d only been to one before, last June, and it was pretty pathetic. The dealer’s room was sparse, and hardly anyone was in attendance. Or maybe they were all in the movie (IIRC it was a Wonder Woman fan film). All this seen through the context of my search for affordable copies of 1940s-era Flash Comics led to me spending a grand total of an hour there before leaving. The writers on the new Flash series would be there, signing autographs. 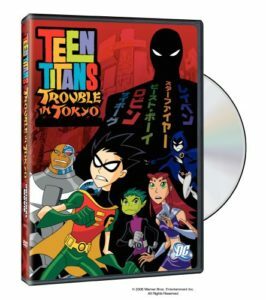 They were screening Teen Titans: Trouble in Tokyo, a full-length movie that will otherwise only be shown on Cartoon Network. With #3, that meant Katie wanted to come along too. So we got up early (for a weekend), went out to breakfast at Ruby’s and drove up to LA. I was shocked to see a line to get in. And the place was comparatively packed. I could swear there were twice as many dealers, and 2 or 3 times as many attendees. My best guess is that a lot of people stayed home in June since it was only a month before San Diego Comic-Con. I cruised the dealer’s room, found some comic book adaptations of The Colour of Magic (1/4) and The Light Fantastic (full set), and a couple of Elric books, looked at what I thought might be the autograph table to see if Bilson and DeMeo were there (the Flash writers), didn’t see them, and joined Katie as we waited for the movie to start. You see, the actor who does the voice for Beast Boy was signing autographs (and using it as a way to collect money for PETA — you got an autograph by making a $2 donation). They wanted everyone in line to get an autograph. He wanted to keep reminding people that they really should pick up some of the PETA literature he had up front. The movie was supposed to start at 12:30, and didn’t get underway until at least 1:00. Fortunately it was a lot of fun… until 45 minutes in, when the DVD started skipping and catching. And no one did anything about it. The guy sitting at the control table, as near as anyone could tell, wasn’t even trying to do anything. After a few minutes — yes, minutes — of this, people started leaving in earnest. About this time the people running the movie finally got around to fixing, cleaning, or whatever they needed to do to the DVD, so we got to see the rest of the movie. Trouble in Tokyo was very good. The story was a bit predictable in places, but it kept up a manic pace and had tons of humor. There was a travel montage early on that was just one joke after another, and some drop-down-funny parts scattered through the film. The one that practically had us on the floor was in a sequence with a sushi chef trying to convince Cyborg to leave his all-you-can-eat restaurant by handing him ever-more-ridiculous dishes. We still left after maybe 4 hours, but it was an interesting four hours! This entry was posted in Comics, Conventions, Sci-Fi/Fantasy and tagged cartoons, Cross-Post, Flash, Imported Post, LA Comic/SciFi Con, Los Angeles, See Also: LiveJournal, Teen Titans on September 10, 2006 by Kelson.